Hey Everyone. I hope you are all well and are having an amazing week so far. I am off today and just spending the day doing absolutely nothing. I did an 18 hour shift at work yesterday in order to get time off for my holiday yesterday and had a super hectic shift so I definitely need a day where I just don't do anything and today has definitely been one of those days. I have literally spent the entire day blogging and coming up with idea for blog posts which I need to do anyway because I'm away for most of November so make sure you keep an eye on my blog as there's going to be quite a lot of new posts over that time. Anyway, today I thought I'd do a post telling you about my Autumn/Winter essentials. If you hadn't already realised, Autumn is my favorite time of the year as everything is just so much better from the weather to the fashion. I will be splitting this post up into different categories so I really hope you enjoy this post. Before I beat the record for the longest introduction in the world let's get straight into it. Lips - I recently did a post all about my favorite lip products for the autumn/winter months which was my previous post so I won't go into too much detail here however when it comes to lips my favorite shades are burgundy and deep red shades as I think they suit the autumn/winter months so well. It's also a color I have to wear all the time for work so the burgundy/red shades are a definite winner for me. Nails - Like with lips red/burgundy have to be my go to shades when it comes to nails in the autumn/winter months. As well as this having to do with the fact that my uniform code strictly forbids any other colors but red/pink I also think it's one of the few colors that actually suits my skin tone and I personally love them. It's got to the point now where even the girl who does my nails says to me 'You want your usual shade lovely'...oops. But yeah I absolutely love it. Blushes - In winter months I love that cold outdoor glow kinda look. Obviously I don't want to look like a clown but I love using shades of pink/rose gold on my cheeks as I find these are perfect autumn shades. I love using blushes that give me that just flushed appearance as I think that's a gorgeous look for this time of the year and one that I'll be sporting a lot throughout the next few months. Oversize Jumpers - Oversize items are something I pretty much wear all the time all year round anyway. I just think they are so super comfy and cosy. However I tend to go a little over the top in the autumn/winter season and purchase anything that's oversize, especially jumpers as not only do they go with absolutely everything but they are also super cosy and comfy and just a wardrobe staple in general. Ankle Boots - I'm actually kinda frustrated that the weather isn't that bad to whip the ankle boots out just yet but these are another essential for me around this time of the year. I just love how well they go with any outfit. Even if you're on a night out there are ankle boots for literally any occasion making them the perfect shoe from this time of year. I have about 12 ankle boots in my collection and I have no intention of stopping as there are so many amazing styles out there this year. Denim Skirts - Another autumn/winter essential for this time of year is definitely denim skirts. Skirts have always been something that I have had a love hate relationships with for years. I always find them too tight or they don't quite fit my bum right. However this sumer when I was on holiday in France I came across two absolutely amazing fitting skirts and have been wearing them non stop since. I just think they are outfits you can dress up and down, they go amazing with ankle boots and kneel high tights and are really the perfect clothing item no matter what the season. It's definitely a wardrobe essential. Netflix - Now that the days are getting shorter, the nights are getting longer and the weather is slowly but surely getting colder and more rainy what better way to chill out on days off than to catch up with your favorite TV show and all the chocolate? The UK version of netflix has got some amazing films and shows on there at the moment so it's definitely with signing up to especially for this time of the year. Cinammon Hot Chocolate - I absolutely love cinnamon hot chocolates. Not only do they taste absolutely amazing and are perfect for when you're ill but they also get me really excited for the Christmas season. Yes I did just drop the 'C' word in there. Oops. Ice Skating - If there's one thing I want to do more of at the moment it's ice skating. It's something that I absolutely love doing and I'm even considering taking lessons just for the fun of it. I mean why not right? Ice skating is definitely something that I love doing at this time of the year. I think they are the perfect thing to do if you're thinking of a date night idea or even just something you want to do with your siblings or best friends. Salted Caramel - I love everything salted caramel and for a while when though a stage of making my own salted caramel hot chocolates last year. I don't just like salted caramel in drinks I absolutely love it in other foods as well such as chocolates and cookies which I know are pretty unhealthy but hey, a girl's gotta treat herself sometimes right? Lush Baths - I am more of a long shower person than a chill in the bath with a good book and glass of prosecco person every other time of the year apart from the winter months. There's nothing better than getting in from a long day at work when it's really cold outside and running a bubble bath full of lush cosmetics bath bombs. It's just so relaxing and really warms you up and makes you feel relaxed. At the moment it's most definitely too warm for baths but I am desperate for it to get more chilly so I can indulge into a nice lush bath, literally! Candles - Candles are something that are lit in my house and room all year round however my favorite scents normally tend to be released around this time. I love all the wintery scents like cinnamon ,and apple spice related candles. I'm just so excited to go on a massive candle shopping spree soon so I can get my house and room all set up for the winter months! So there we have it. A list of all my must have essentials for the Winter months. I hope you enjoyed this post. Make sure to leave me a comment below of all your favorite essentials for this time of year. 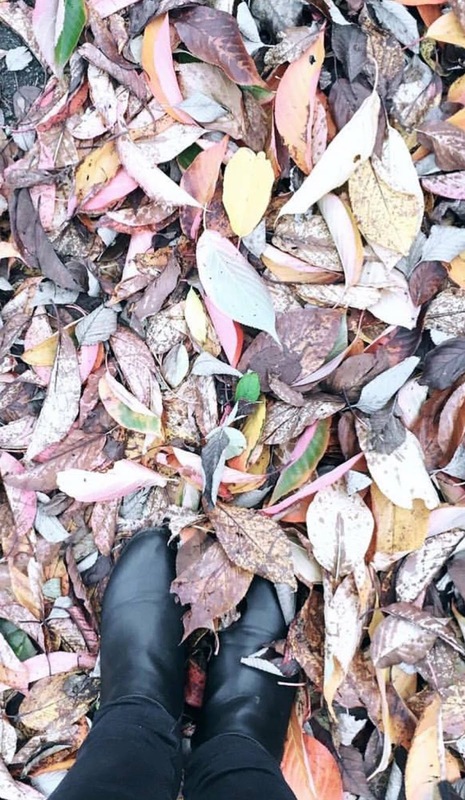 Also let me know how many times I used the words 'Autumn/Winter' in this post because I don't think it was enough (HA). Take care of yourselves, be kind and I'll speak to you all in my next post.